Preparing for a new baby (or two!) is such a joyful time in life and designing the nursery should be too! We've compiled our best tips for designing your nursery in three easy steps. These nursery design tips are helpful hints towards creating a nursery that's beautiful and functional! Let's be honest, every nursery revolves around the crib! With a selection of colors and styles, you'll find the perfect fit for your nursery design. Convertible Cribs and Grow With Me Cribs - have you heard of them? If not, you're in for a treat! These cribs are the perfect choice for your growing little one. With a few additional pieces, your crib can convert to a toddler bed, a preschool daybed, and a full size bed. These innovative designs allow your nursery to grow along with your girl or boy throughout the years - plus, you won't have to replace their furniture, unless you want to! With life a little more hectic than before, you'll want to stay organized - or at least attempt to do so! Functional furniture and storage pieces are always the perfect option and a great way to stay neat in this cluttered life of baby toys and beyond. While options vary between collections, we love anything with a little extra value. Dressers with added changing table tops hold all your necessities while providing a space you'll certainly need in the nursery. Additional hutches can offer more storage on top of the changing table or dresser - especially great for the typically smaller rooms used for nurseries! Under-crib drawers add storage for those additional blankets and bedding. Tall storage pieces like chests and armoires are perfect for ample storage space in a small footprint. 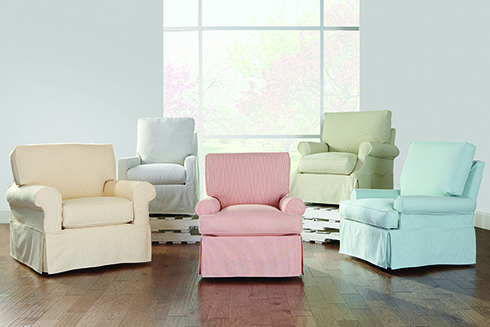 Traditionally, nurseries include a glider rocker for soothing that little one to sleep. Our latest addition to our Kids Showroom includes a variety of options for nursery gliders from Rowe, along with a sweet selection of washable fabric suggestions. These gliders including the Norah, the Sophie, and the Nantucket, are slipcovered for cleaning and available to customize in your choice of fabrics. Dreaming of the perfect nursery but not quite sure where to start, what to pick, or how to complete the room? Take advantage of our free design services or get started online with our Design Help page. From furniture selection to finishing the room with accessories, our knowledgeable staff are here to help guide you through the process.